2019 was a year of immense promise but substantial disappointment for Fiorentina. As I enter the second half of my second campaign with the Viola, I’m hoping the new year will bring new fortune. On just the second day of 2020, we battled Atalanta for a Coppa Italia Semi Final place for the second season in a row. If we could avenge last year’s defeat and prevail at the Artemio Franchi, we could look forward to a two-legged Semi against Pescara or – more likely – Juventus. Despite not officially playing an offside trap, our defence did an excellent job of regularly catching Atalanta’s attackers offside in the opening stages. La Dea’s backline looked less assured in the 20th minute, when Gianluca Mancini miscontrolled an interception from Viola right-back Kevin Diks‘ long ball. That allowed Riccardo Saponara to burst into the box and unleash a half-volley, which somehow missed the net. The visitors missed a great chance themselves three minutes from half-time. Their own Dutch wing-back Hans Hateboer found Andrea Petagna with a near-post cross, but the big target man could only steer his header wide. The second half saw a host of opportunities from Valentin Eysseric, who would soon sign a new three-and-a-half-year contract with Fiorentina. The in-form inside-forward missed the net twice before scuffing a shot straight to Pierluigi Gollini in the Atalanta goal. We moved no closer to breaking the deadlock until VAR got involved in a couple of incidents in Atalanta’s box towards the end. Nicolò Fazzi was adjudged not to have fouled Federico Chiesa in the 80th minute, but fellow defender Lorenzo Tonelli was not so lucky when he was accused of pushing Pietro Pellegri two minutes later. Despite missing his only previous penalty for us, Pellegri made no mistake from the spot this time around. That gave us a late lead, which Eysseric strengthened in the 88th minute after a smart exchange of passes with Chiesa. Valentin was now on eight goals for this season – one behind Pietro’s club-best haul of nine. Atalanta got a goal back almost straight away, with teenage midfielder Dejan Kulusevski’s header warning us not to count our chickens before they’d hatched. However, there would be no second away goal – and no last-minute red card – to wreck our cup dream. Sweet revenge had been exacted. We could now amend our February schedule and make plans for a Semi Final tie against the mighty Juven- hold on. Am I reading this correctly? PESCARA WON 2-1! At the Allianz Stadium! Well… I guess that means we’ve got a couple of dates with the giant-killer Dolphins next month. I’ll take that. The Italian transfer window was a surprisingly quiet one for us. None of our established first-teamers would be leaving permanently, though a couple of lacklustre offers were made for defenders Germán Pezzella (from Saudi Arabia) and Nikola Milenkovic (from Valencia). As I’d hinted at in an earlier chapter, Nikola Kalinic was sent back to Atlético Madrid after we cut his loan spell short. The Croatian striker scored just twice in 11 outings during his second coming at Fiorentina, which must go down as one of the worst comebacks since The Verve reunited. Sandro Tonali was another summer signing who had not lived up to expectations, though the midfielder had a good excuse – he was still only 19. When rock-bottom Cagliari offered to take Tonali on loan for the season, and give him regular Serie A football, I was happy to agree. A few months battling for top-flight survival could be the making of young Sandro. Three other youngsters were loaned out to lower-league clubs. I’m particularly interested to see how 20-year-old Luca Ranieri gets on with Ternana in Serie B. If the pacey and determined left-back does well, I will seriously think about promoting him to the first-team next season. Tonali’s temporary move to Sardinia meant I sought to bring in a more established midfield playmaker on loan. My first choice was the experienced Liverpool man Georginio Wijnaldum, but he turned us down and went to Lyon. To be honest, I’d seriously question the judgement of someone who claims to support both Barcelona and Real Madrid. A move for Bayern München’s Renato Sanches also failed to materialise, as he instead fancied sitting on the bench of Serie A leaders Napoli. I then turned to another Portuguese wonderkid – Benfica’s Florentino Luís. Sadly, Florentino would not be coming to Florence either, as his agent failed to submit the required paperwork before the deadline. Bloomin’ agents. First to come in was Emil Antonsen – a Denmark Under-19s international midfielder who cost us €2million (potentially rising to €3.5million) from FC København. Antonsen is very determined, very hard-working, and he looks very well-rounded for someone so young. He also has a silhouette for a face, which is probably a good indicator that I need to update my facepack. As Kalinic packed his bags and returned to Spain, I brought a replacement striker in from La Liga. At only €3.7million, Santi Mina is a low-risk (and potential high-reward) purchase from Valencia, for whom he scored 26 top-flight goals in four-and-a-half seasons. Mina might not look amazing at first glance, but he’s quick, intelligent, and he likes to place his shots into the net instead of powering them in. At 24 years old, he still has a little room for improvement, so I’m hoping he’ll develop into a useful frontman over time. Before returning to Serie A duties, we kept our match fitness up with a couple of friendly matches. First up was a trip to France, where Nîmes were maimed by Domenico Berardi. Berardi scored two goals in the first half (either side of an irresistible strike from Jordan Veretout) as well as setting up Dusan Vlahovic for another. Vlahovic then rounded off the scoring by completing his brace in the second half. It was an unforgiving experience for our hosts, who had just a single Bakary Sako strike to their credit. We then went back to Belgium, where Mechelen gave us rather more of a test. Some unconvincing goalkeeping from Daniele Padelli gave them an early opener, which Eysseric cancelled out. Another Berardi goal appeared to have won us the game in the second half. Then Mechelen got a very lucky equaliser in injury time, with a speculative shot taking a heavy deflection off Bryan Dabo before finding the net. Hmm. The second half of the Serie A season began with a rematch of our opening-day meeting with Lazio. We had stunned the Biancocelesti with a late comeback at the Olimpico, and that had helped to stall a title challenge before it could really begin. Now Simone Inzaghi had taken his charges to the Franchi to try and set things straight. Lazio quickly came out of the blocks, with wing-back Adam Marusic threatening to score after just five minutes. The Montenegrin struck from a tight angle, but Alban Lafont stood his ground and pushed it behind. That was a sign of things to come from our Roman visitors. They racked up goodness knows how many corners (partly because the FM19 match engine loves them), and former Liverpool men Divock Origi and Lucas Leiva each seriously tested Lafont. We also conjured up some opportunities, twice clipping the Lazio woodwork. Pellegri’s header from a Chiesa cross in the 31st minute skimmed the crossbar, as did a free-kick by Chiesa himself three minutes before the break. Our luck did not change in the second period. Thomas Strakosha strengthened claims that he was one of the league’s best goalkeepers with an excellent save to deny our centre-back Vítor Hugo in the 48th minute. Berardi flicked a Chiesa free-kick over the bar about 10 minutes later. The Biancocelesti were themselves struggling to break the stranglehold, but they would eventually succeed in the last few seconds. With a 0-0 draw looming, Brazil centre-back Wallace sprinted into our six-yard box to convert Pedro Rebocho’s inswinging corner. Lazio had survived a close shave, and I was feeling understandably cheesed off after our fourth home defeat of the season. There would be more pain after that cruel defeat. Not only did Torino beat Udinese 2-0 to retake 7th position on goal difference, but all of the top four won their matches. Napoli stayed top by putting a couple of goals past Atalanta, while Milan recovered from their tailspin to beat Bologna 2-1. A rematch of the Coppa Italia Quarter Final saw Juventus reverse their 2-1 defeat to Pescara, and a first-half quartet of Inter goals did for Salernitana. A week after narrowly falling short against Lazio, we hoped for better fortune at the San Siro. Facing 4th-placed Inter of course meant we had to try and blunt their three-pronged strikeforce. On this particular night, that would be easier said than done. Gabriel Barbosa set up a great chance for one of his strike partners in the third minute, but Matteo Politano’s volley sailed inches over the bar. Politano would be cursing another miss in the 29th minute, after great work from Inter’s third frontman. Lautaro Martínez squared Miguel Almirón’s searching ball to Politano, who burst through the defence before driving his shot against the woodwork. Our attackers were having rotten fortune of their own. Mina could have got his full Fiorentina start to the great start in the 10th minute, but he miscued a shot from Dabo’s lofted through-ball. Eysseric later twisted his knee in a collision with Inter midfielder Radja Nainggolan – an injury that would curtail his game five minutes from half-time. Thanks to some improved Nerazzurri shooting, we would head into that interval trailing 2-0. Politano’s luck had turned in the 33rd minute, when he outpaced Milenkovic to Martínez’s through-ball and cut it in from a difficult angle. A second assist came Lautaro’s way two minutes, when his floated cross provided a ninth ‘Gabigol’ of the season for Barbosa. I abandoned the ambitious 4-2-3-1 for a more conservative system in the second half, but Inter were soon making a mockery of ‘Fullerball’ as well. Having set up each of his colleagues earlier, it seemed only fitting that Martínez should score the third goal from a Politano corner in the 48th minutes. The Nerazzurri were 3-0 up, and it was surely game over. Then came a ray of hope for the Viola in the 51st minute. Mina went down after an apparent trip from Inter left-back Danilo D’Ambrosio on the edge of the area, and after a lengthy delay, VAR ruled that it had taken place inside the box. One could always rely on Berardi to score from 12 yards, and he didn’t let me down here either. Another D’Ambrosio foul two minutes later – this time on Dabo just outside the box – would prove just as costly to the hosts. Up stepped our free-kick expert Saponara, who curled it past the Nerazzurri wall and right into the top-left corner of Samir Handanovic’s goal! We were now full of beans, and it wouldn’t be long before the turnaround was complete. A 59th-minute counter-attack saw Chiesa run onto a cross-field pass from Mina before laying it right to the onrushing Saponara. Ricky slickly slotted it past Handanovic for his second goal, and in the space of eight minutes, we had come from 3-0 behind to equalise! The drama didn’t end there, though. Inter relentlessly pursued their fourth goal throughout the next half-hour, and when they did break through again in the 89th minute, it couldn’t have been any jammier. A curling Politano free-kick came back off the post before right-back Sime Vrsaljko – that’s Sime ‘1 Goal In 253 Career League Appearances’ Vrsaljko – stuck a leg out to poke the rebound across the line! Inter 4, Fiorentina 3. After all the effort we had put in, we really did not deserve that. This latest heartbreak left us three points off the top seven, and TWELVE adrift of the top four. If we wanted to qualify for the Champions League next season, we would surely need to win the Europa League. The long-standing top two of Napoli and Milan eked out a couple of 1-0 victories over Salernitana and Empoli. Milan were still looking nervously over their shoulder for Juventus, whose 3-1 home win over Cagliari was their sixth successive Serie A victory. It perhaps wouldn’t be too long before the rampant Bianconeri fully caught up. After last-gasp defeats in our previous two matches, the last thing we wanted to do was prepare for a visit from Napoli. Carlo Ancelotti’s team were top of Serie A without a defeat to their name, and on a run of seven straight clean sheets in all competitions. Indeed, the only loss that had been inflicted on the Partenopei all term was by Real Madrid in the Champions League, when both teams had already qualified from their group. The odds were firmly stacked against us, and a confident start from Napoli only added to the fears of the Viola tifosi. It took a couple of strong saves from Lafont to keep out early headers by centre-backs Eliaquim Mangala and Kalidou Koulibaly. Our own central defenders – Vítor Hugo and Federico Ceccherini – also had lots of work to do to dispel the visitors’ attacks. On a brighter note, we did give Napoli’s seemingly unbeatable goalkeeper Alex Meret a couple of tests midway through the half. Marco Benassi whipped a shot into Meret’s hands before the 22-year-old caught a header from Pellegri. Then, two minutes before half-time, Napoli’s Slavic triumvirate linked up for arguably their best attack yet. Slovakian playmaker Marek Hamsik neatly controlled Polish winger Piotr Zielinski’s cross-field ball before laying it off to a second Pole. Had Arkadiusz Milik’s shot flown a couple more inches to the right, we would surely have been 1-0 down. Buoyed by that late let-off, we started to put Napoli under real pressure in the 50th minute. One of Christian Nørgaard‘s apparent weaknesses is that he doesn’t like big matches, but the Danish regista showed no nerves in taking on left-back Mário Rui and crossing into the box. Pellegri then rose above a static Koulibaly to meet it with the header that ended Meret’s run of clean sheets – and put us 1-0 up on the league leaders! It was soon a case of ‘all backs to the wall’ for the Viola. We kept ourselves very compact for the rest of the match to frustrate Napoli’s attackers and preserve our lead. One man who particularly impressed was Diks, who worked his socks off and put in some key tackles on his way to being named ‘Player of the Match’. Kevin seemingly “doesn’t enjoy big matches” either. As if. This was a Napoli team uncharacteristically low on ideas and imagination, not to mention discipline (they picked up six bookings). Our pragmatic approach paid off, and Carlo Ancelotti’s unbeaten run lay on the Franchi turf in shreds at full-time. Napoli’s first defeat of season sent shockwaves across Serie A. With Milan having thrashed Chievo 5-0 earlier that evening, the top two were now separated only on head-to-head. Juventus’ 3-1 win over Cagliari moved them within five points of the lead, though 4th-placed Inter could only draw 0-0 at Verona. Torino and Sampdoria were each beaten by Lazio and Udinese respectively, which meant we were now in a three-way points tie for 6th. Head-to-head records put us just above Samp in 7th, but behind Torino. That’s not the best of sights, to be fair, but remember – we were down in 13th not that long ago! You’ll notice that Veretout had fallen out of favour, having been left out of the squad for the Inter game, and then only featuring as a late substitute against Napoli. There was a good reason for that. You see, Monaco had renewed their interest in our midfield mezzala. Between the Lazio and Inter games, they offered us €16million – potentially rising to €21million – to sign him. I turned the offer down, mainly because he was almost irreplaceable, but also because we literally could not replace him, now that Serie A’s transfer window had slammed shut. Veretout did not appreciate that at all, and he made his feelings clear to me the next day. When I told him he’d be better off playing for us than sitting on Monaco’s bench (as he perhaps would’ve been), he let out a Gallic shrug and said he’d take his chances. I then offered him a pay rise to keep him sweet, but he just sulked off. Whether he likes it or not, Veretout is staying at Fiorentina for now. As a manager, I will always put the team’s interests above any player’s. If Jordan is still complaining at the end of the season, then I’ll let him chase the money, and I’ll instead focus on those players who do want to play for this club. 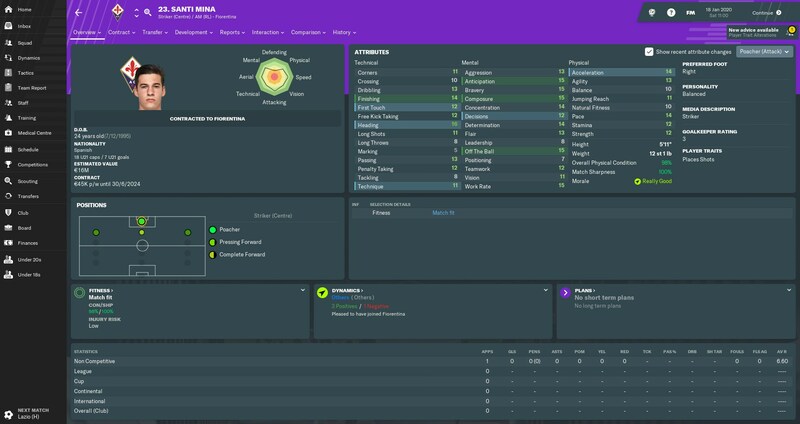 I’m a season-and-a-half into my Fiorentina career, and that is our worst injury yet. It’s the first time we’ve had a first-team player ruled out for at least two months. Ceccherini was by no means a regular starter, but he would be missed. I hope that’s whetted your appetite for February, which is set to be our busiest and most crucial month yet. We’ve got NINE matches on the horizon – five in Serie A, plus a couple of two-legged ties in the Coppa Italia and the Europa League. That’ll be sure to test my squad rotation system to the limit. 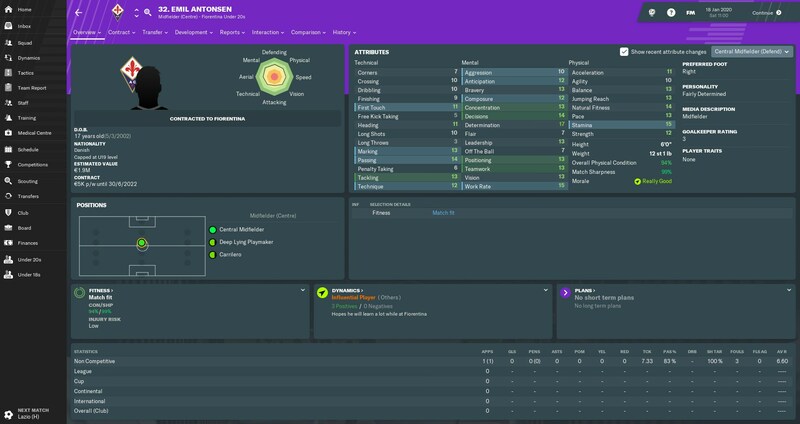 This entry was posted in FM19, Shades of Deep Purple and tagged Fiorentina, FM19, Football Manager 2019 on 18 November 2018 by Chris Fuller. Excellent post….. Read it with my cuppa at work this morning. Great Result v Napoli when the pressure was on. Keep up the good work and make the posts as long has you like for me I just enjoy reading them.